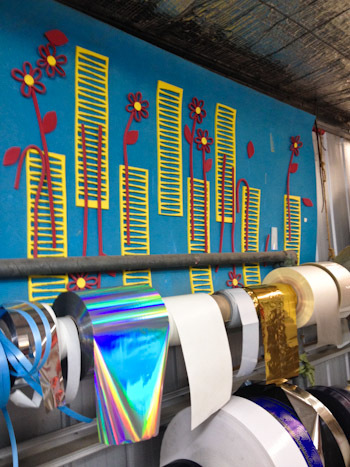 The best way to decorate festivals is with recycled materials, and in Melbourne, the best way to source decorative recycled materials is from Reverse Truck Art! 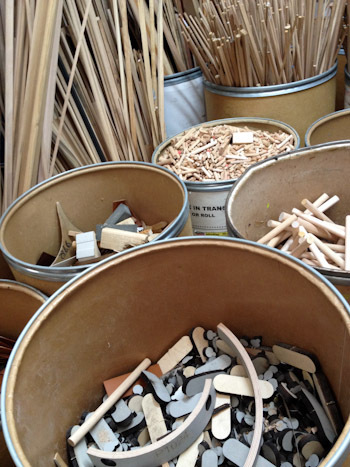 Much like Reverse Garbage in Sydney and Melbourne, Reverse Art Truck has been collecting rejects, seconds and factory off-cuts and supplying them to the community for over thirty years. 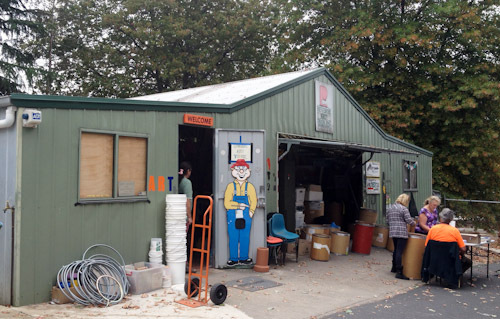 We visited the shed premises of Reverse Art Truck at Ringwood. Although it's a small building, it holds many treasures! 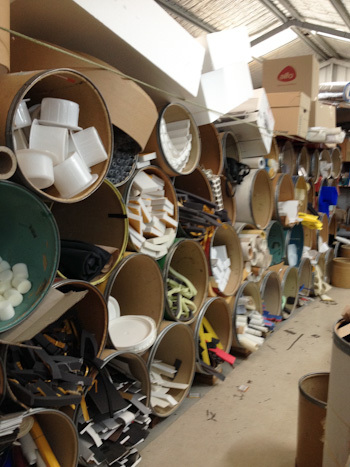 Quantities of odd off-cuts are neatly sorted and displayed in cardboard tubs. As soon as we reached Melbourne last month, we became caught up in our various friends’ Confest preparations. Confest is one of the most family-friendly festivals on the Australian circuit, and we’re so excited to be part of the Family Tent crew this year. The Family Tent operates as a free-for-all creativity centre for everyone, and we use a budget supplied by Confest organisers to stock the space with art materials and lots and lots of random craft objects that will be turned into God-knows-only-what by the imaginations of those wielding sticky tape, scissors and paint during the five-day festival. So we arrived at Reverse Art Truck with a budget for eighteen big garbage bags, which — on a personal level — meant that each of the girls could fill their own personal shopping bag with anything that caught their eyes and their imaginations! 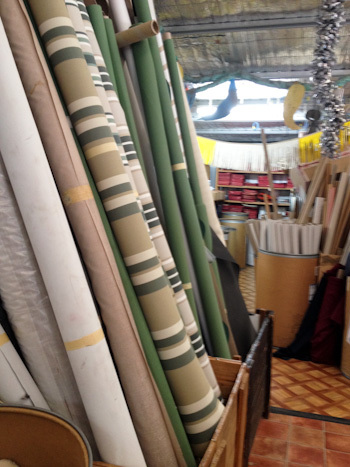 Rolls of fabric and shade-cloth materials make this a great stop for those creatively wanting to make their own home improvements! A selection of smaller trinkets is accompanied by the sign "Please take small amounts in this section." I love the way the girls look through the tubs carefully and choose exactly what they want. 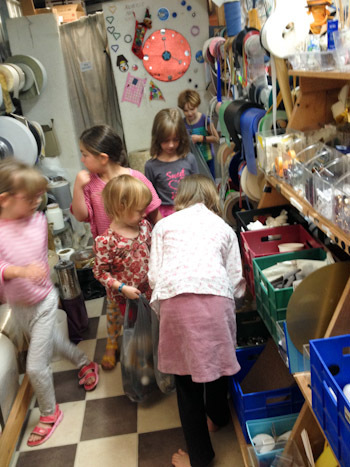 It's rare to be in a shop where the kids can select so freely from the shelves. My girls loved the experience! I personally found the quantity of stock overwhelming when thinking about how children could use the materials for their projects, so I soon gave up and let our friend Hagai choose what he needed for the Family Tent. Instead, I focused on ideas for decorating one thing (the women’s Red Tent) and found I could narrow my search and select the materials I knew I could work with. 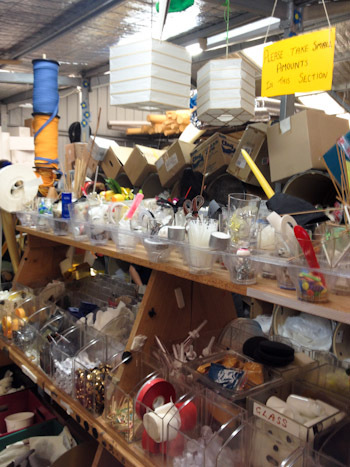 Crafts are on display around the shed, providing ideas of what can be created with the materials on hand. Truly, in a place like this, you're only limited by your imagination! Although busy, the staff at Reverse Art Truck are approachable and friendly; it was a joy to talk with them and I know they would help out with any special requests if they could! If you’re a Melbourne-based parent of a crafty child — or perhaps an artist with an interest in using recycled materials — Reverse Art Truck should be high on your list of places to find inspiration!